Russia claimed its place in the World Championships final six with a sweep of Finland, behind 18 points by substitute Victor Polataev. Italy rested all of its starters and still came out with a 3-1 win over the Netherlands, bouncing back after dropping the first set to remain atop the group. 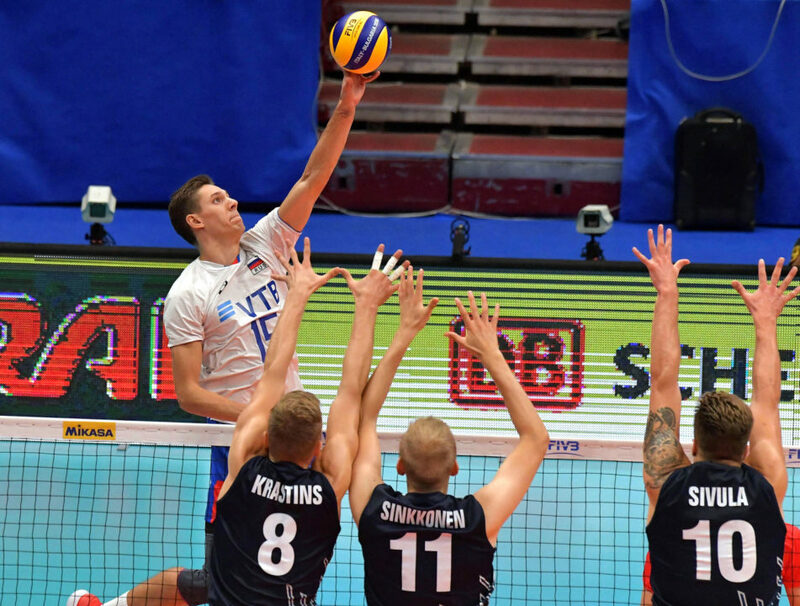 Russia piled up 13 blocks to stifle the Finnish offense in the 3-0 win. The Russians allowed just one stuff and boasted a 41-37 lead in kills and 7-4 edge in aces in the match. Both teams went deep into their benches, with Russia utilizing 12 players and Finland putting 11 men on the court. Victor Poletaev notched a match-high 18 points after entering the match in relief for Maxim Mikhailov in Set 1, posting 14 kills, three aces and a block. Yury Berezhko added 11 points on nine putaways, a block and an ace and Ilyas Kurkaev registered 10 points, including a match-high seven blocks. Artem Volvich chipped in nine points (5 kills, 3 blocks, 1 ace). Dmitriy Muserskiy took the night off,. Samuli Kaislasalo scored 12 points, all on putaways, to lead the Finnish team, after coming to take over from Urpo Sivula in Set 2. Sauli Sinkkonen added nine points on seven kills and a team-leading two aces. Antti Ronkainen managed five points in a Set 3 effort for Finland in its Worlds finale. Russia led by just one at 11-10 in Set 1 before Mikhailov took over and upped the advantage to four at 16-12. The Russians led by seven at 22-16 and despite Finland’s best efforts to slow them down, closed out the 25-17 win. The defending European and VNL champs cruised to an 8-2 edge in Set 2 with strong serving and big blocks. The Finnish team narrowed the gap to five at 15-10, but was no match for Russia, as Poletaev finished off a seven-point contribution in the 25-19 win. Trailing 11-8 early, Finland kept pace with Russia, pulling within two at 17-15. Down 20-16, the Finnish side made another push, pulling even at 22-all behind the serving of Sauli Sinkkonen. Russia scored three straight to end any hope of Finland closing out the comeback. Despite the loss, Finland saw hopes for the future and also recognized the accomplishment of reaching the second round. The Dutch made it a difficult road with 11 blocks (to 7), but couldn’t quite keep pace with Italy on Sunday. The Italians outdid the Netherlands in kills (55-48), aces (4-1) and points off errors (27-25), edging the Dutch 93-85 in total points. Italy utilized its substitutes in the match, resting all seven of its regular starters. Luigi Randazzo managed a match-high 23 points, all on kills, while Gabriele Nelli (19) and Davide Candellaro (10) also managed double-digit scoring efforts in their starting roles. Nelli turned in 18 kills, while Candellaro added five kills, a team-best three aces and two blocks. Gabriele Maruotti chipped in seven kills, while Enrico Cester managed six points on a team-leading four blocks and two kills. All six starters plus libero Salvatore Rossini played the entire match without additional help and all but Rossini scored at least one point. For the Dutch, Thijs Ter Horst led a group of three players with double-digit point tallies, recording 15 points (14 kills, 1 block). Michael Parkinson (12) and Thomas Koelewijn (11) followed. Parkinson was key on the block with five stuffs to go with seven kills, while Koelewijn added two to his nine kill tally. Thirteen players saw action for the Netherlands with 10 scoring.